You are here: News / Don’t Miss Kelsea on GMA’s Summer Concert Series! 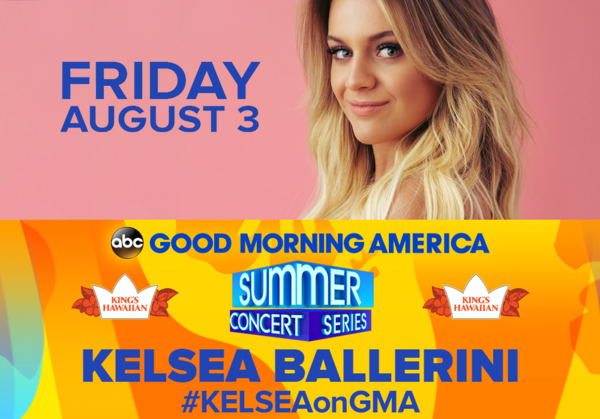 Don’t Miss Kelsea on GMA’s Summer Concert Series! Legends! Kelsea is performing FRIDAY 8/3 as part of GMA’s Summer Concert Series! The concert will be held in New York City’s Central Park and is completely FREE to the public! It was so amazing meeting Kelsea! She made everyone feel so special! I Hate Love Songs, but I love Kelsea! Super excited. Got my iota tickets. My daughter can’t wait. @giggles - it's not letting me respond...absolutely on the 2 extra tix in my name. If you have FB messenger (karyn koller lincavage)we can chat / meet up to go in together. I am in need of 2 tickets please! I would love to surprise my daughter who is one of Kelesa's biggest fans!! If it's open to public, do you really need 1iota tickets? Or does that just get you in ahead of public! Just got my ibotta tix & huge surprise for my 7yr old who loves Kelsea!!! Cannot wait!!! I got wait listed on 1iota :( can't take a Chance travelling that far then not get in... I have a super sad daughter!